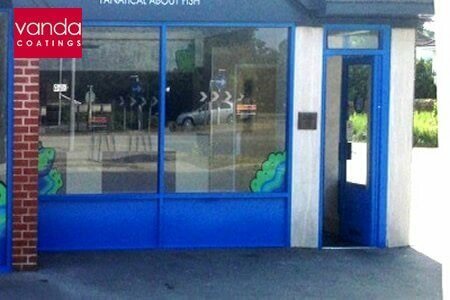 Shop Front Refurbishment in Dorset. Our specialty is re-spraying the metalwork on large commercial buildings anywhere in the UK, but sometimes we also take on some smaller projects. 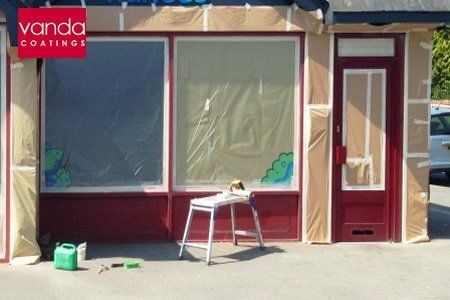 Shop front refurbishment in Dorset was one such job and it involved re-coating all of the framework around the door and windows both inside and out. The first thing our Vanda team had to do was to clean the frames as the exterior was quite dusty and the inside was very greasy. All metal is cleaned before we paint it, but more time than usual was spent cleaning on this very hot summer day. This was followed by masking off the pay point and counters. In fact, everything was covered in plastic to prevent any overspray from marking items that were not being refurbished. All the interior and exterior glass as well as the 2 door frames were also masked up. Part of this prepped, red shop front can be seen in the bottom photo. Then all the surfaces due to be painted were rubbed down in order to key the metal substrate so that the top coat would stick to it. A final clean with a de-greasing agent also ensured good paint adhesion. We always take time to clean and carefully prepare metal before re-spraying shop fronts. There is no point in re-coating anything unless surfaces are prepared properly otherwise the paint will simply flake off further down the line. Once all the preparation had been completed our Vanda operatives sprayed the metalwork a vibrant blue. Because the metal had been powder coated originally, a primer wasn’t necessary, so after abrading and cleaning the surface, the final layer was spray applied directly on to it. The result of this shop front refurbishment in Dorset can be seen in the top right photo.